Responsive, Multi Formats, Multi Bitrates, Advanced Stream Player. 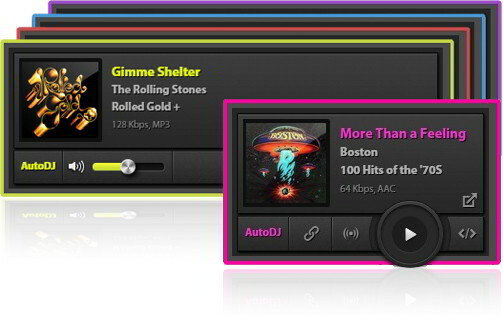 This state-of-the-art HTML5 stream player is our most advanced embedded player solution. This service is only available to the Pro Plan customers. Different Mount-Points are not meant for different channels/different streams, but to offer alternative bitrate and format for the same stream content. Alternative Bitrates are used to offer the listener an option to choose the stream quality, the stream format/codec is used to ensure compatibility with various devices and browsers. The listener will be able to choose the bitrate, the format will be automatically selected depands on the listener device/browser. If left blank mount 1 will set to default. - Setting the width to less than 395px will cause the volume bar to be hidden.